As soon as you enter this beautiful piece of soul-quenching land, the greenery will slow down your pace, so that you can enjoy a laid-back vacation. Kerala truly has everything that can make your dream vacations come true. This Kerala tour package of 6 nights and 7 days includes Munnar the gateway of Hills in South India. On the way, you can also watch the lovely waterfalls of Cheeyappara & Valara. Thekkady, it offers diverse attractions wildlife sanctuary, hill station, and spice plantation. 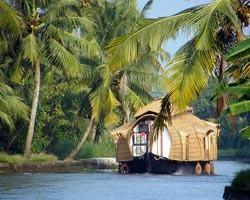 Alleppy, the Houseboat for a 20-hour long cruise through the world famous backwaters of Kerala. Full day leisure time at the Cherai beach, indulge in water sports or stroll on the beach. Book this amazing Kerala trip now. After breakfast Check out of the hotel from Thekkady by 8.00am and proceed to Alleppey to check in to the Houseboat for a 20 hour long cruise through the world famous backwaters of Kerala. Houseboat (Kettuvalloms) is a indigenously developed and designed private boat with fully furnished spacious bath attached bed rooms, hygiene kitchen ,dining area and private front deck to capture the beauty of the back waters. The cruise through palm fringed narrow canals, the unique life of the backwater people and above all the nature around you will make long lasting impressions in your mind. Overnight stay in a houseboat. After sumptuous breakfast, Check out of the houseboat from Alleppey at 9.00 am and proceed to Cherai beach. On the way visit Cochin Sight seeing..Visit Fort Cochin beach, Chinese Fishing nets , St.Francis Basilica , Jew Synagogue, Matanchery Street. Later proceed to Cherai. Leisure time at the Beach. Overnight stay at Cherai. Full day leisure time at the beach, indulge in water sports or stroll on the beach. Overnight stay at Cherai.